Description: BN #2176 leads a group of locomotives to the shops. Description: With 22 cars in tow, the PYT heards towards Yakima. Description: PYT prepares to back his cars into 6 Track in Yakima. The cars to the left of the engine is the 41-car outbound train. Description: The PYT is now seen heading back towards Pasco. 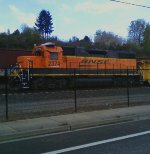 In addition to his 40 cars, he also picked up a Columbia Basin GP7u. Description: Here sits the PYT, waiting on a track inspector who is clogging things up. Description: THe station is a great photo prop. Description: A local heads for the paper plant in Sartell. Description: With so few of the geeps in the old striped scheme, it was nice to see! Description: A pair of Geeps bounce and rock down the old Northern Pacific yard, now the "T Yard" at Northtown. Title: 080713004 Eastbound BNSF Bare Table departs Union Yard on Midway Sub. Title: 080713011 Eastbound BNSF Bare Table rolls through CTC St. Anthony on Midway Sub. Description: This ex GM&O Geep is still hard at work on the BNSF with the 2374. Description: The BNSF-UP transfer heads back to Northtown Yard. Description: An abbreviated CP-BN transfer heads up the hill.